A date has been set for the return of one of television’s most eagerly anticipated shows: SherlockSeason 3 will premiere on Masterpiece on Q-TV on Sunday, January 19, 2014 at 10 pm, following the 9 pm broadcast of Downton Abbey. "The genius Sherlock team has done it again," says Masterpiece executive producer Rebecca Eaton. "These new episodes are as wildly-imaginative and brilliantly-produced as all the others. These people are GOOD!" Nearly 11 million viewers tuned into the second season of Sherlock, which ended with one of the most shocking cliffhangers in television history. Fans flocked to the internet to speculate about Sherlock’s "demise," and express their eagerness to find out what happens next. Don't miss the premiere of Sherlock Season 3 on Sunday, Jan. 19, 2014, 10pm ET, after Downton Abbey on MASTERPIECE on PBS. 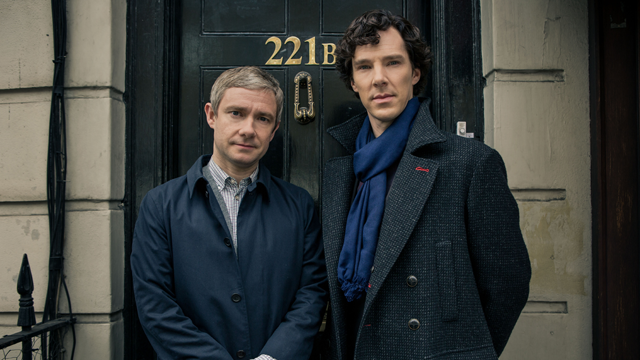 "We love that Sherlock fans are so passionate and eager to see Season 3," says PBS chief programming executive and general manager of general audience programming Beth Hoppe. "The pairing of Downton Abbey and Sherlock in January offers a blockbuster night of British drama only on PBS stations."